There have been plethora of websites to find jobs in Ghana, Africa for some time now. However most of these website are localised in Ghana with a few expanding gradually across other African countries. The job boards attempting to expand are mostly focused on anglophone countries without any major provisions to reach francophone countries etc., probably due to limitation with respect to the multilingual capability of their websites. Jobdirecta.com is essentially a job search engine providing a one stop solution to finding jobs in not only Ghana but all other African countries. Jobdirecta.com aggregates jobs from other job boards in Ghana, classifieds in Ghana, News papers in Ghana inter alia. The website is hosted on secured servers per its strong adherence to user data protection. Job seekers can create accounts in very easy steps and start applying for all live jobs in Africa on the web, jobs in Africa on our mobile version, or find jobs in Africa on our Android app on the go. The Jobdirecta.com job website also provides recruiters in Ghana, Africa and employers in Ghana, Africa alike a recruiter account to remotely post jobs all over Africa, Ghana without engaging the Jobdirecta administrators unlike almost all other job websites in Ghana, Africa where recruiters normally have to email their job descriptions to the admin of websites to upload unto their websites. Recruiters are also provided with a robust integrated Applicant tracking system to assist with their recruitment process from shortlisting job seekers , invitation for interviews, filtering of applicants etc. 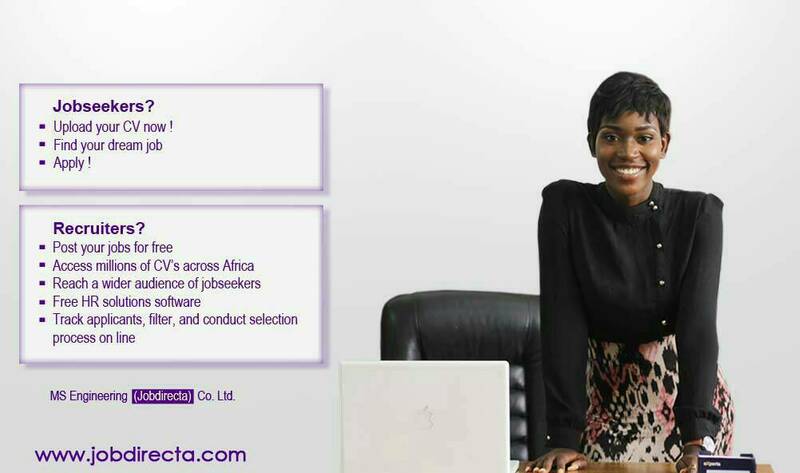 That being said, if you are a job seeker looking for job opportunities in Ghana,Africa, Visit the No.1 job website in Ghana, Africa and find your dream job in Africa. Recruiters should also go ahead and create their recruiter account and start posting jobs in Africa,Ghana and reach talented candidates in Africa, Ghana.